Milo Porter leads a happy life in Tampa, Florida. The Iraq war veteran runs routine private investigations by day and coaches powerlifting at night. When Chad Scalzo, the grandson of a rumored mob boss, goes missing, Milo takes the seemingly easy case. After Chad turns up dead, Milo goes from investigator to suspect. As he seeks to clear his own name, Milo finds himself at the crossroads of two crooked investigations — one by the mob and the other by the police. With the body count climbing, Milo discovers the key to the case in the last known person to see Chad alive. But can Milo get to her before someone else does? 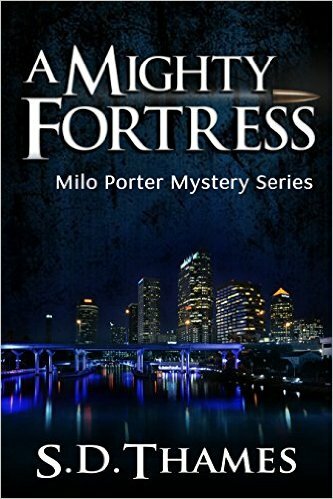 A Mighty Fortress is the first book in the Milo Porter mystery series, a set of gritty crime thrillers that will remind you of the characters from Robert B. Parker and Robert Crais. If you like gripping suspense, hardboiled crime-solvers, and heart-stopping action, then you’ll love the powerful series starter from S.D. Thames.